All Exits Are Clearly Marked. A controversial pain-relief anesthetic was pierced into her abdominal muscle, so she could feel less pain. Instead, now she can feel nothing. Witness a new mom’s conviction in her ability to become more and more sensate, the more she is numbed by the health marketplace. This piece unfolds as a conversation between the artist and Baul poetry from the 17th and 18th centuries. It uses a cappella singing and live art to carve entries, pathways, and exits, out of this healthcare morass. Ritika Ganguly has trained in multiple genres within Bengali music and in contemporary Indian theater. 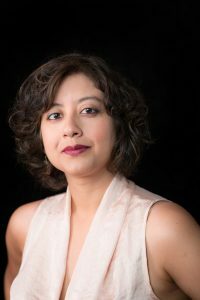 She is inspired by theatre thinkers across the subcontinent, and strives to bring to the stage free, non-proscenium theatre. Her vocal and compositional style integrates a wide variety of forms coming out of Bengal, including Baul, Rabindra Sangeet, Nazrul Geeti, and Shyama Sangeet. She debuted her new musical work Osthir as a commissioned artist at the Cedar Cultural Center earlier this year.